Lately in a number of wine publications I have seen the AVA talked about and discussed at great length. What I was reading talked about how one area produced one kind of grape, or how this are produced a more acidic grape. 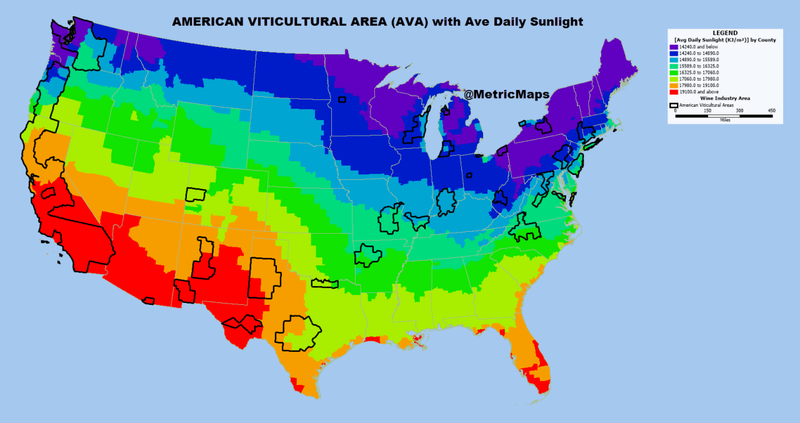 As I have a background in geography this discussion got me curious, so I thought I would take a look at what an American Viticultural Area really is. American Viticultural Areas (AVA) is a designated wine grape-growing region in the United States distinguishable by geographic features, with boundaries defined by the Alcohol and Tobacco Tax and Trade Bureau (TTB) of the United States Department of the Treasury. This surprised me. I just assumed that if a government agency would control a designation like this, it would be the U.S. Department of Agriculture. When a winery in the United States wants to let you know the geographic pedigree of its wine, it uses a tag on its label called an Appellation of Origin that provides the geographic origin of where the grapes were grown. An appellation is a legally defined and protected geographical indication used to identify where the grapes for a wine were grown; other types of food often have appellations as well. Restrictions other than geographical boundaries, such as what grapes may be grown, maximum grape yields, alcohol level, and other quality factors, may also apply before an appellation name may legally appear on a wine bottle label. An appellation may be defined by political boundaries or a federally recognized American Viticultural Area. Twenty-four states have AVAs that are single state AVA. As you would guess this means the entire are of the AVA is within the political borders of a single state. Additionally there are fifteen AVAs that cross state borders. Just to muddy the waters, in some places the same plot of ground may be in two separate AVAs. For instance, the AVA of Martha’s Vineyard is a single state AVA in Massachusetts. Martha’s Vineyard is also listed as a part of the multi state AVA of Southeastern New England. AVAs range in size from the Upper Mississippi Valley AVA at 29,900 square miles across four states to the Cole Ranch AVA in Mendocino County, California, at only 60 acres. The Augusta AVA surrounding the area around the town of Augusta, Missouri, was the first recognized AVA, gaining the status on June 20, 1980. Unlike most European wine appellations of origin, an AVA specifies only a geographical location from which at least 85% of the grapes used to make a wine must have been grown. AVAs are more similar to the Italian Indicazione Geografica Tipica than other European appellation of origin systems. American Viticultural Area designations do not limit the type of grapes grown, the method of vinification, or the crop yield. Some of those factors may, however, be used by the petitioner to justify uniqueness of place when proposing a new AVA.